One of the less explored gems of Garhwal Himalayas, Dayara Bugyal is captivating in its own unique way. Bugyal in Garhwali means "Alpine Pasture or High Altitude Meadow". It is arguably one of the prettiest meadows one would come across while trekking in the Himalayas. A perfect trek to step into the Himalayas as you walk through dense jungles, gaze at mighty Himalayan peaks, spend your evenings beside a high altitude lake and a walk on this endless pasture makes this trek very enticing. 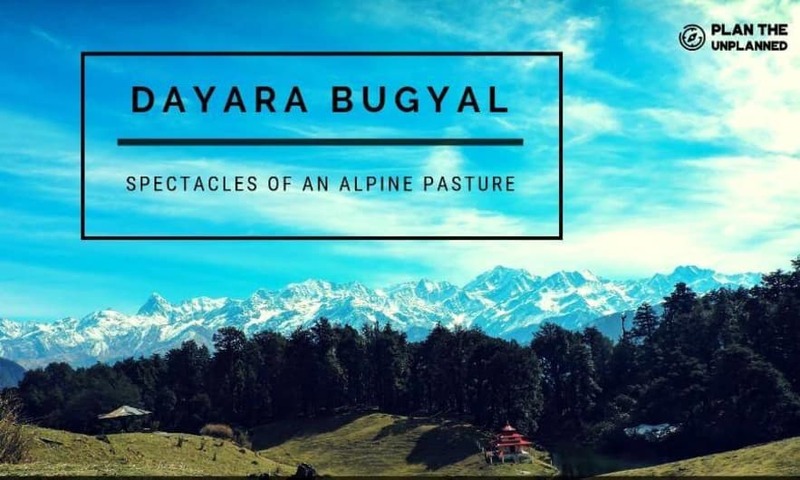 This Bugyal is situated in the Garhwal Himalayas of Uttarakhand at an elevation ranging from 10,000 - 12,000 ft. Dayara Bugyal offers some of the best views of Mt. Bandarpoonch, Swargarohini, Black Peak, Gangotri Ranges, DKD, Srikantha to name a few. So much for a low lying trek that it does not feel real and yet the trekkers are lost in its beauty and the quietness that this place provides. - Transport: Non AC coach from Dehradun to Barsu back. - Meals: At Barsu, Dinner and breakfast will be served on the day of the arrival. During the trek, vegetarian food and eggs will be provided. Dinner at Barsu on the day of completion of the trek will be provided. - Trekking and camping equipment like tents, mats, sleeping bags, spikes, gaiters etc. Entry fee for the park, Environment levy fees, camping and forest fees. - Any charges for carrying still/video cameras etc. - Soft drinks, bottled water, beverages, etc. - Personal expenses like tips, telephone calls, laundry, etc. - Trekking gear like trekking bag, shoe, trekking pole etc. - Any costs arising out of unforeseen circumstances like landslides, road blocks, bad weather, etc. All participants are required to submit a medical certificate approved by a registered medical practitioner prior to the trek. Apart from this we highly recommend you having an adventurous spirit and willingness to undergo the joys & hardships of outdoor camping, in addition to good physical and mental fitness, to completely enjoy the trek. If you suffer from severe muscular, chest, heart or bronchial ailments, we advise you against participating since most treks happen in remote areas with limited access to medical services & hospital facilities. Our Trek Leaders are experienced mountaineers and we trust their judgements. If during the trek, the Trek Leader advises you against continuing on the trek, we request you to respect his judgement and follow his instructions. 1. Please carry a valid ID proof along with the valid ticket. 2. High Ape is not responsible for any injury or damage occurring due to the event. 3. People in an inebriated state will not be given entry. 4. Being only a ticketing portal, High Ape does not take any responsibility for the activities going on inside or outside the event, as the entire responsibility of it is of the organizer/venue. 5. Please go through the details on the Event Details Tab and the Checkout page thoroughly before booking the tickets, as the tickets which are NOT booked in compliance with it will not come in the ambit of discussion. 6. Internet handling fee per ticket applied. Please check your total amount before payment. 7. Tickets once booked cannot be exchanged or refunded. 8. Unlawful resale (or attempted unlawful resale) of a ticket would lead to seizure or cancellation of that ticket without refund or other compensation. 9. Alcohol (if available) will be served only to guests above the legal drinking age (LDA) and on display of valid age proof. 10. In case a booking confirmation e-mail and SMS gets delayed or fails because of technical reasons or as a result of incorrect e-mail ID / phone number provided by the user etc, a ticket will be considered 'booked' if the payment has been processed by High Ape and you will have to contact our representatives for issue of tickets. 11. Arms and ammunition, eatables, bottled water, beverages, alcohol is not allowed from outside to the event. Food and beverages will be available inside the event. 12. Persons suspected of carrying items that may be used in an offensive or dangerous manner, or carrying out illegal activities within the site may be searched. 13. Venues/Organizers are solely responsible for the service; availability and quality of the events. Discover Awesome Nightlife Events, Activities & Places in Rishikesh.